Chia seed is an ancient oilseed used by Mayas and Aztecs as foodstuff. This seed is a natural source of omega-3 fatty acids (alpha-linolenic acid), soluble and insoluble fibers, and proteins in addition to other important nutritional components, such as vitamins, minerals, and natural antioxidants. Chia can be considered as - a functional food ! 1.Combat Diabetes :Chia is being studied as a potential natural treatment for type-2 diabetes because of its ability toslow down digestion. The gelatinous coating chia seeds develops when exposed to liquids-can also prevent blood sugar spikes. 2.Good source of fibre : Just a 28-gram or 2 tablespoon serving of chia has 11 grams of dietary fibre — about a third of the recommended daily intake for adults. Adding some chia to your diet is an easy way to make sure you're getting a good amount of fibre, which is important for digestive health and avoids constipation problems. 3. Omega-3 fatty acids : Chia seeds are packed with omega-3 fatty acids, with nearly five grams in a one-ounce serving. These fats are important for brain health. 4.Stronger Teeth And Bones : A serving of chia seeds has 18 per cent of the recommended daily intake for calcium, which puts your well on your way to maintaining bone and oral health, and preventing osteoporosis. 5. Manganese isn't a well-known nutrient, but it's important for our health: it's good for your bonesand helps your body use other essential nutrients like biotin and thiamin. One serving of chia seeds, or 28 grams, has 30 per cent of your recommended intake of this mineral. 6. Phosphorus : With 27 per cent of your daily value for phosphorus, chia seeds also helps you maintain healthy bones and teeth. Phosphorus is also used by the body to synthesize protein for cell and tissue growth and repair. 7. High Protein source : Chia seeds also make a great source of protein for vegetarians and don't have any cholesterol. One 28-gram serving of these super seeds has 4.4 grams of protein, nearly 10 per cent of the daily value. 8. Fights Belly Fat : Chia's stabilizing effect on blood sugar also fights insulin resistance which can be tied to an increase in belly fat, according to Live Strong. This type of resistance can also be harmful for your overall health. 9. Improves appetite : Tryptophan, an amino acid is also found in chia seeds. It helps to regulate appetite, sleep and improve mood. diabetics, and may also increase healthy cholesterol while lowering total, LDL, and triglyceride cholesterol. 11.Help weight loss : Chia seeds are popular for weight loss. They reduce food cravings by preventing some of the food that you eat from getting absorbed into your system. This blockage of calorie absorption makes them a great diet helper. 12. Anti-oxidants : Chia seeds can be added safely to any detoxification programs. 13.Hydration :Chia seeds are highly hydrophilic these seeds are excellent for athletes. The chia seeds can absorb huge amounts of water and so they are very good in hydrating the body. 1 cup ( 200 ml ) plain water . Simply add the chia seeds to water and stir well. After about 1 hrs. the gel will be thick enough to hold a spoon . Chia gel will keep refrigerated for about two weeks. Just mix Chai seed gel with fresh fruit juice , lassi , buttermilk , green tea , milk , soup or simply with water. Chia seed is smell less and tasteless versatile kitchen ingredient. While making your regular bread making dough , just add the Chia seed gel into the dough and roll your usual chapatti , roti , paratha etc. Quantity : 200 gms SUPER FOOD - CHIA SEED (Salvia hispanica) Chia seed is an ancient oilseed used by Mayas and Aztecs as foodstuff. This seed is a natural source of omega-3 fatty acids (alpha-linolenic acid), soluble and insoluble fibers, and proteins in addition to other important nutritional components, such as vitamins, minerals, and natural antioxidants. 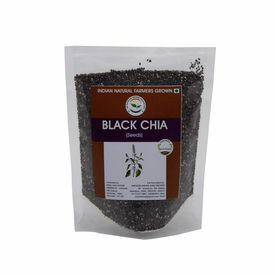 Chia can be considered as - a functional food ! Benefits of chia seeds : 1.Combat Diabetes :Chia is being studied as a potential natural treatment for type-2 diabetes because of its ability toslow down digestion. The gelatinous coating chia seeds develops when exposed to liquids-can also prevent blood sugar spikes. 2.Good source of fibre : Just a 28-gram or 2 tablespoon serving of chia has 11 grams of dietary fibre — about a third of the recommended daily intake for adults. Adding some chia to your diet is an easy way to make sure you're getting a good amount of fibre, which is important for digestive health and avoids constipation problems. 3. Omega-3 fatty acids : Chia seeds are packed with omega-3 fatty acids, with nearly five grams in a one-ounce serving. These fats are important for brain health. 4.Stronger Teeth And Bones : A serving of chia seeds has 18 per cent of the recommended daily intake for calcium, which puts your well on your way to maintaining bone and oral health, and preventing osteoporosis. 5. Manganese isn't a well-known nutrient, but it's important for our health: it's good for your bonesand helps your body use other essential nutrients like biotin and thiamin. One serving of chia seeds, or 28 grams, has 30 per cent of your recommended intake of this mineral. 6. Phosphorus : With 27 per cent of your daily value for phosphorus, chia seeds also helps you maintain healthy bones and teeth. Phosphorus is also used by the body to synthesize protein for cell and tissue growth and repair. 7. High Protein source : Chia seeds also make a great source of protein for vegetarians and don't have any cholesterol. One 28-gram serving of these super seeds has 4.4 grams of protein, nearly 10 per cent of the daily value. 8. Fights Belly Fat : Chia's stabilizing effect on blood sugar also fights insulin resistance which can be tied to an increase in belly fat, according to Live Strong. This type of resistance can also be harmful for your overall health. 9. Improves appetite : Tryptophan, an amino acid is also found in chia seeds. It helps to regulate appetite, sleep and improve mood. 10. Improves Heart Health : Chia seeds have been shown to improve blood pressure in diabetics, and may also increase healthy cholesterol while lowering total, LDL, and triglyceride cholesterol. 11.Help weight loss : Chia seeds are popular for weight loss. They reduce food cravings by preventing some of the food that you eat from getting absorbed into your system. This blockage of calorie absorption makes them a great diet helper. 12. Anti-oxidants : Chia seeds can be added safely to any detoxification programs. 13.Hydration :Chia seeds are highly hydrophilic these seeds are excellent for athletes. The chia seeds can absorb huge amounts of water and so they are very good in hydrating the body. HOW TO EAT CHIA SEED: Chia seed gel : 1 tablespoons chia seeds 1 cup ( 200 ml ) plain water . Simply add the chia seeds to water and stir well. After about 1 hrs. the gel will be thick enough to hold a spoon . Chia gel will keep refrigerated for about two weeks. Way to use chia seed gel : 1.Use as an egg-substitute in baking : 1 egg = 1 tablespoon chia seeds + 3 tablespoons water = about 1/4 cup gel 2.Add to smoothies , juices , lassi , green tea or in plain water : Just mix Chai seed gel with fresh fruit juice , lassi , buttermilk , green tea , milk , soup or simply with water. Chia seed is smell less and tasteless versatile kitchen ingredient. 3.Add it with bread dough : While making your regular bread making dough , just add the Chia seed gel into the dough and roll your usual chapatti , roti , paratha etc.